The Brunson 10 is back up to five members, after the departure of Alec Torelli in January. Taking his sopt in the lineup is online poker sensation Alex “AJKHoosier1” Kamberis, who will join Dani “Ansky” Stern, Chris Moorman, Amit Makhija, and Zachery Clark as special representatives of the popular poker site –Doyles Room is the 4th most heavily trafficked poker room. 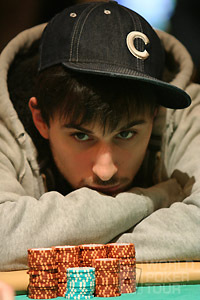 Kamberis brings a lot of online poker credentials to the table, including an estimated $4 million in online winnings. In an interview with Bluff Magazine, Kamberis stated he basically took last year off, and only participated in a few events like the PCA and WSOP. He even pared down his online schedule considerably. However, he went on to add, I’m coming back. Online, live everything. I’m going to remind people that I can play.” And being added to the Brunson 10 ensures we’ll be hearing a lot from the young poker pro in the future. This entry was posted on Thursday, February 25th, 2010 at 9:19 am and is filed under Poker News. You can follow any responses to this entry through the RSS 2.0 feed. You can leave a response, or trackback from your own site.